Don't underestimate the important of good alignment. The more you can set up square to your target line, the easier it will be to putt towards your target. If you have ever had a golf lesson you will have heard the expression "Set up square at address." This refers to the need to keep your shoulders, hips, knees, and feet in a straight line and parallel to your aimline. The analogy a golf instructor will typically use is the parallel tracks of a railway line with you standing on the one track and your club aiming down the other track. Your putting alignment is no different. Dave Pelz in his book Dave Pelz’s Putting Bible talks of Flow Lines when referring to the importance of having your body parallel left to your aimline. You should align yourself from the ground up. 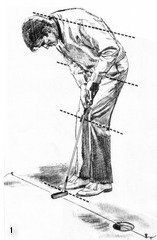 Firstly place the putter behind the ball using your left hand. Once your putter blade is aligned to your aimline you can then place your right hand on the grip. Aligning your putter blade is easier if you use a line (or the logo) on your ball. It is then simply a case of matching up the line on the ball and the alignment line on your putter. Once you have set your grip, you need to align systematically your other body parts. Most important in your setup is the alignment of your shoulders and your forearms. The direction your shoulders point will influence the path that your putter follows. Open shoulders can lead to pulled putts, closed shoulders to pushed putts. The most consistent way to direct your putter path along your aimline is for your shoulders to be parallel left to this line. If you use a conventional grip of right hand low, there will be a tendency for your right forearm to rise above your left forearm. This will also cause your shoulders to open slightly with the left shoulder moving back. You need to be aware of this and make the necessary adjustment. This can be achieved by tucking your right elbow into your right hip. The most common variations among professionals in their alignment are the positioning of their feet (and hips). Lee Janzen aligns his feet slightly to the left of his aimline, though he says he would prefer that they were parallel. Jim Furyk prefers a slightly closed stance. Dave Stockton, on the other hand, has a slightly open stance. The important point about alignment is that your shoulders and forearms remain parallel left of your aimline. The alignment of your lower body is less important unless it adversely influences the parallel alignment of your upper body.